The tiny tots represent the new generation that will grow up with the wonders of Windows 10. Well, and they're cute. 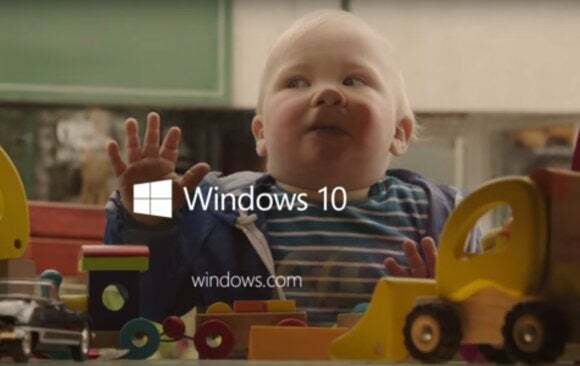 In Microsoft’s first Windows 10 ad, there aren’t any clicks or clacks or dancing cheerleaders—or, really, that much Windows. It’s a soft approach to a product that Microsoft seems to expect will change the world, if not transform the company. Windows is shown for about seven seconds, with a quick montage of Hello, the Start menu, the Edge browser, and Cortana. Instead of showing how any of the Windows 10 technologies work, however, Microsoft chose to explain how a new generation will grow up with what Windows 10 embodies: touchscreens, the disappearance of passwords (Windows Hello), a digital assistant who talks to you (Cortana), and more. Interestingly, though, Cortana never speaks, and simply responds via text. This may indicate that the ad will be shown in the United Kingdom as well as the United States. Remember, Windows 10 launches on July 29—there’s not too much time to go! Why this matters: Microsoft is apparently kicking off the Windows 10 campaign in much the same way that it's promoted Windows 10: quietly, somewhat humbly, without the bravado of earlier launches. So far, however, its also kind of dull. What do you think? Tell us in the comments below. This story has been edited to reflect that, yes, well, there is a Live Tile or two. But no dancing cheerleaders.